Royal Canin Medium Light maintains the health of joints strained by excess weight, maintains the ideal weight, and preserves and tones the muscles. Also ensures a healthy digestive system using RC's new Acti-Digest formula. 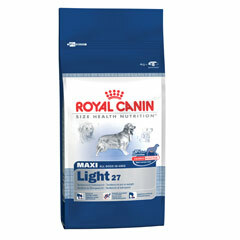 Tailored nutrition for Maxi dogs with weight problems (15 months+, weight 25-44kg).